People often ask how we get so much healthy produce, and how we manage to turn every dollar into four healthy meals. One of the answers to both questions is Farm to Family. In the old days (before the program started in the late 1990s), farmers’ surplus product would often get plowed under or rot in the fields. And hard-to-sell produce outside of certain size and shape ranges was simply tossed. The result was a lot of waste of perfectly good—and healthy—food, in a state where today nearly 4.9 million don’t get enough to eat. Enter Farm to Family. 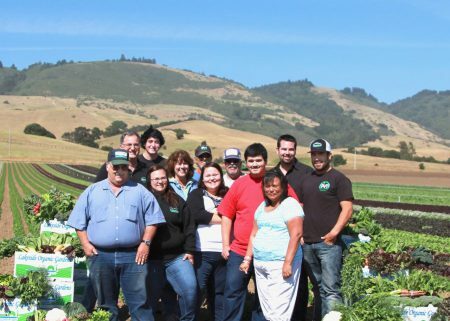 An initiative of the California Association of Food Bank (CAFB), the program obtains surplus produce from farmers, sorts it all in packinghouses and then ships it to member food banks across the state, like Second Harvest, to the tune of 125 truckloads per week. Often, the farmers donate the produce outright; other times, CAFB purchases it for pennies on the pound, which helps defray the farmers’ costs of harvesting and helps them provide more stable work for farmworkers. The impact on food banks and people in need is immense. Second Harvest gets access to a wealth of produce—40 varieties, from apples to zucchini—and the people we serve can access nutritious food, whatever hardships they’re going through. Last year Farm to Family provided 140 million pounds of fresh fruits and vegetables to low-income Californians–and it’s just one of Second Harvest’s secrets behind the “magic” of turning every dollar donated into four healthy meals!